Washington, D.C. is known for its stunning architecture, rich history, and some of the country's most iconic monuments and attractions. There's no shortage of luxurious accommodation options to choose from. You'll find hotels with butler services, rooftop infinity pools, Michelin-starred hotel restaurants, and elegant marble bathrooms. The Watergate Hotel is famous for being involved in one of America's biggest political scandals. Visitors who choose to stay here know that it offers stylish, comfortable rooms and plenty of amenities. 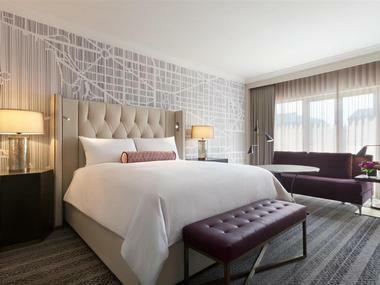 The rooms offer views of either the city or the Potomac River, and they're furnished with flat-screen TVs, work desks, and elegant marble bathrooms. There are also suites, some of which come with full kitchens, fireplaces, and balconies. When not relaxing in their rooms, guests can visit the rooftop bar, enjoy a meal at the hotel restaurant, or get some exercise in the on-site fitness center. Decorated with Thomas Jefferson memorabilia, including authentic signed documents, The Jefferson is a boutique hotel located inside a beautiful Beaux-Arts building. Upscale amenities include a full-service spa and a fine-dining restaurant, but guests will likely find themselves wanting to spend time in their rooms, which boast elegant furnishings like fireplaces, four-poster beds, and Italian marble bathrooms with free-standing tubs. 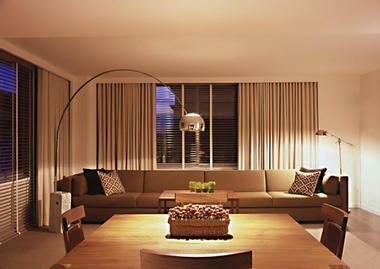 Some rooms also have separate living areas, and complimentary Wi-Fi is available throughout the hotel. In addition to 24/7 room service, the hotel offers a 24-hour butler service to cater to guest needs. The Willard InterContinental is a splendid world-class hotel in Washington, D.C., located on Pennsylvania Avenue, two blocks from the White House and half a mile from the National Mall. 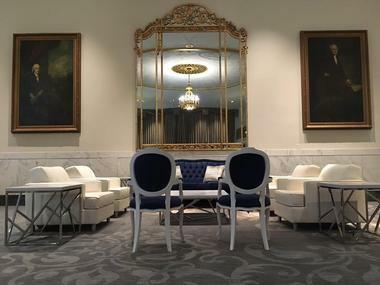 The stately 1818 hotel offers 335 elegant guest rooms and suites blending historic and contemporary decor, offering top modern amenities such as 47-inch flat screen televisions, mini bars, and Nespresso coffee makers. There are 41 suites, many of which feature luxury amenities, including separate living areas, butler pantries, dining rooms, and even a sunken jacuzzi in one of the suites. Hotel guests are able to utilize our Tesla Chauffeur Service weekdays from 7am-9am. Upscale dining options include Cafe du Parc, which serves traditional French cuisine, and Le Bar, which serves up coffee beverages during the morning hours and an extensive wine glass list during the evening hours. Elegant afternoon teas are also hosted each Saturday and Sunday at Peacock Alley, with classic cocktails served at the hotel's iconic Round Robin Bar, long known as a lively political meeting spot for the city's top government luminaries. 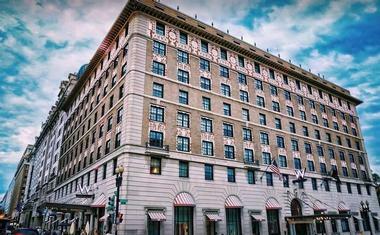 Situated only a quarter mile away from the White House, the Sofitel Washington DC Lafayette Square occupies a historic building constructed in the 1880s. However, the rooms boast all sorts of modern touches, including complimentary Wi-Fi, flat-screen TVs, and well-stocked minibars. Suites with separate living and dining areas are available as well, and all guests are provided with complimentary toiletries and access to 24/7 room service. Other amenities include a chic French bistro, a well-equipped fitness center, a business center with several meeting rooms, and free coffee and tea served in the mornings. With its excellent location and its selection of almost 900 elegant rooms, the Grand Hyatt Washington is a great choice for both business and leisure travelers. 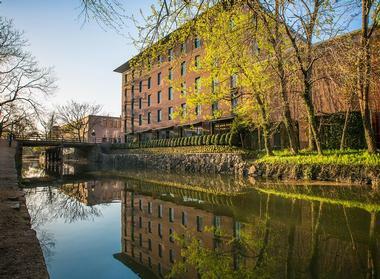 Hotel amenities include a restaurant and bar, a cafe, a state-of-the-art fitness center, and a business center with more than 40,000 square feet of meeting space. The rooms feature floor-to-ceiling windows that provide great views of the city, and upgraded rooms include access to an exclusive lounge with a complimentary breakfast and light snacks. Many of the city's top attractions are within walking distance, and a concierge is available to help guests plan their visit. 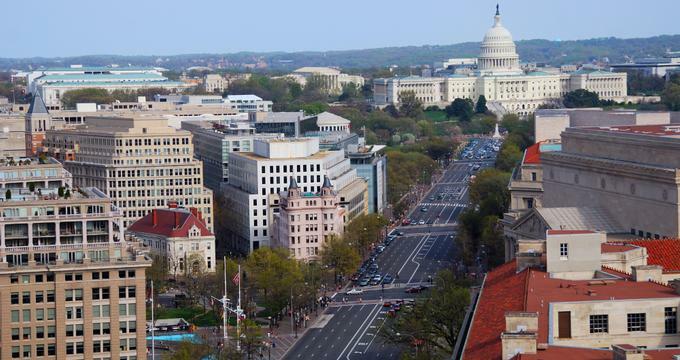 The Hyatt Regency Washington on Capitol Hill is conveniently located right next to the U.S. Capitol, and it offers spacious rooms with free Wi-Fi, flat-screen TVs, and excellent work spaces. The hotel restaurant and bar is open for a daily breakfast buffet as well as for lunch and dinner; it specializes in American cuisine and cocktails, and the food is prepared with organic ingredients as much as possible. 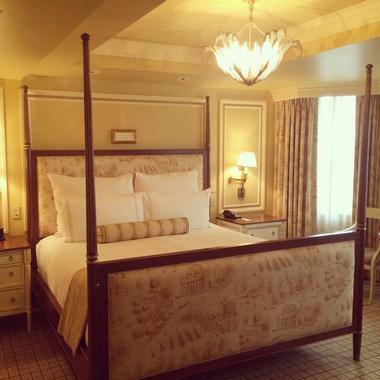 Upgraded rooms come with a free breakfast and complimentary evening hors d’oeuvres. 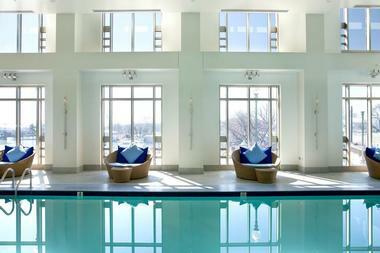 Guests can also make use of the well-equipped fitness center, which features an indoor pool with a skylight. 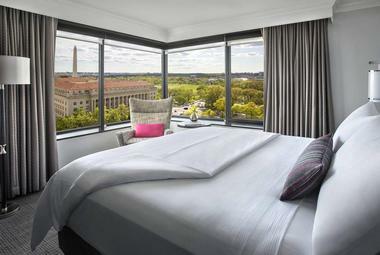 Set right in the city center, the JW Marriott Washington, DC prides itself on its beautiful rooms and its excellent service. All rooms are furnished with high thread count linens, flat-screen TVs, and coffee machines, and upgraded rooms offer stunning city views and access to a lounge with a complimentary breakfast and all-day snacks. On-site dining options include an American-style grill, a chic cocktail lounge, and a Starbucks, and room service is available any time of day or night. The hotel fitness center is open 24/7, and it includes an indoor swimming pool and hot tub. Conveniently located right downtown, the Mandarin Oriental, Washington DC offers luxurious rooms with marble bathrooms and flat-screen TVs. Suites with balconies, panoramic views, and separate living areas are available as well, and all guests are given complimentary Wi-Fi access. Guests are also permitted to use the beautiful hotel spa, which features a heated swimming pool, a steam room, a sauna, and a well-equipped gym. The hotel restaurant specializes in Asian dishes and American cuisine with an international twist, and there is a separate cocktail lounge that offers an excellent selection of alcoholic and non-alcoholic beverages. 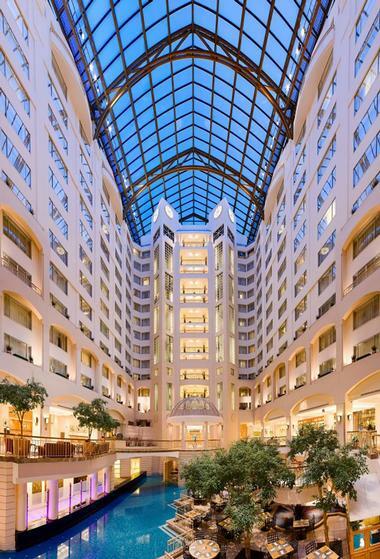 Connected to the Walter E. Washington Convention Center by an underground tunnel, the Marriott Marquis Washington, DC is a great choice for both business and leisure travelers. The beautiful contemporary rooms come with flat-screen TVs, mini-fridges, air conditioning, and work desks, and some also have separate sitting areas or living rooms. Guests who choose to stay in an upgraded room will be given access to a lounge with a complimentary breakfast and evening snacks, but there are also multiple dining options for guests to choose from, including an American-style grill, a sports bar, and a posh cocktail lounge. © Park Hyatt Washington D.C. The Park Hyatt Washington D.C. can be found in the fashionable West End neighborhood, and it offers one of the most luxurious hotel experiences in the city. The rooms boast large flat-screen TVs and free Wi-Fi; some also come with rainfall showers and separate sitting areas. Bike rentals and shuttle services are provided free of charge, and guests can enjoy spa treatments either in the hotel spa or in the comfort of their own rooms. Plenty of excellent restaurants are only a stone's throw away, but the hotel boasts its own Michelin-starred restaurant, which specializes in seasonally inspired American fare. 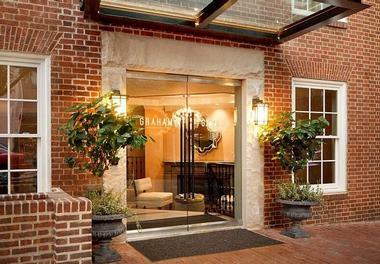 Sitting right next to the Chesapeake & Ohio Canal, the Rosewood Washington DC is a luxury hotel with excellent views. The plush rooms come with free Wi-Fi, smart TVs, and comfortable sitting areas, and the en suite bathrooms boast rainfall showers and complimentary high-quality toiletries. 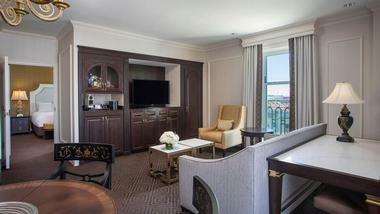 Some rooms also come with free-standing tubs, and guests can also book elegant suites with fireplaces and dining rooms. There are also plenty of excellent amenities, including an upscale grill specializing in artisan meat and seafood, a rooftop lounge with a pool and stunning views of the river and the city, and an on-site spa. The Four Seasons hotels have a reputation for excellence, and the Four Seasons Hotel Washington, DC is no exception. The beautiful rooms come with minibars and marble bathrooms, and other amenities include a full-service spa, a fitness center with an indoor pool and hot tub, and a business center with meeting spaces. Complimentary coffee and pastries are provided in the lobby every morning, and guests are welcome to enjoy lunch or dinner in the hotel's upscale steak restaurant and cocktail lounge. Room service is offered 24/7, and laundry and dry-cleaning services are available upon request. 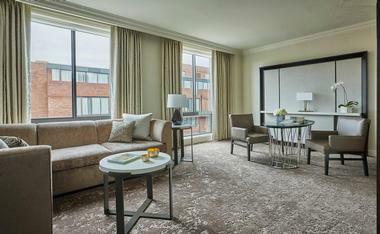 Nestled in the heart of Georgetown, the Graham Washington DC Georgetown, Tapestry Collection by Hilton provides easy access to some of the city's best restaurants, shops, and attractions. There are plenty of things to keep guests busy at the hotel as well; the fitness center is open 24/7, and in the evening, you can head down to the intimate cellar bar for a cocktail or up to the rooftop bar to enjoy excellent views of the city. The comfortable rooms are furnished with pillowtop mattresses and flat-screen TVs, and all guests are given complimentary access to the Wi-Fi. The Kimpton Carlyle Hotel Dupont Circle is located inside a gorgeous art deco building, and it provides a luxurious boutique hotel experience less than a 10-minute walk away from Dupont Circle. All of the rooms come with comfortable Italian linens and pillowtop mattresses, work desks, and flat-screen TVs, and some also include kitchenettes and views of the city. Complimentary coffee is offered every morning in the lobby, and a wine reception is held for guests every evening. The hotel is also happy to welcome pets, and it provides complimentary beds and water dishes. 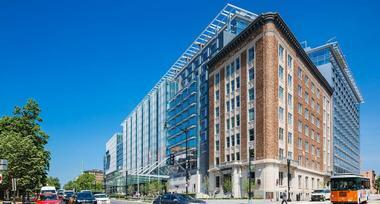 Boasting an excellent location on Capitol Hill, the Kimpton George Hotel offers elegant rooms and a refined French restaurant with a fireplace and an outdoor terrace. 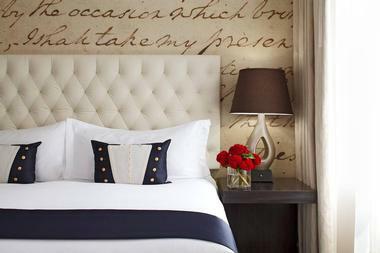 The hotel is decorated with artwork chosen to honor its namesake George Washington, and the rooms are equipped with minibars and flat-screen TVs. 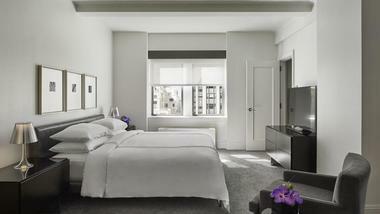 Room service is available 24/7, and in-room spa services can be arranged if desired. The hotel is also proud to provide guests with a wide range of complimentary amenities, including bike rentals, access to a state-of-the-art fitness center with steam rooms, and nightly wine receptions. Offering more than 180 high-end rooms, the Kimpton Hotel Monaco Washington DC can be found inside an old post office that was built in 1839. The rooms offer amenities like yoga mats, flat-screen TVs, and even pet goldfish upon request; guests are also provided with complimentary toiletries and bathrobes, and some rooms even feature spa baths. Loaner bikes are available free of charge, and guests are welcome to make use of the hotel fitness center. The on-site restaurant specializes in small plates and cocktails, and a complimentary wine reception is held for guests every evening. 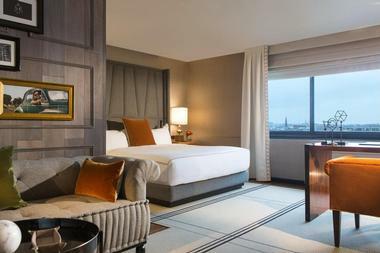 Set on a beautiful tree-lined street, the Kimpton Mason & Rook Hotel is a charming blend of historic and modern. The rooms all come with yoga mats, flat-screen TVs, and high-quality toiletries, and some also feature kitchenettes and bunk beds. Guests are invited to enjoy complimentary coffee and tea in the mornings and complimentary wine in the evenings, and the hotel restaurant serves American-style cuisine for breakfast, lunch, and dinner. The fitness center boasts state-of-the-art equipment and is open 24/7, and guests can also use the rooftop pool and patio during the warmer months. Perched overlooking the White House, the Hay-Adams is housed inside a gorgeous Italian Renaissance-style building that was constructed in the late 1920s. The elegant rooms and suites come with luxurious touches like Bose sound systems and high-quality Italian linens; some even boast private balconies with views of the White House. A complimentary shuttle service is provided for guests who want to explore the area, but there are plenty of things to keep guests occupied in the hotel as well, including a 24-hour fitness center and a rooftop bar that offers panoramic views of the city. Dating back to 1925, the Mayflower Hotel, Autograph Collection holds the honor of being listed on the National Register of Historic Places. The rooms are furnished with flat-screen TVs and elegant marble bathrooms, and the hotel also offers suites with separate living and dining rooms. The hotel restaurant is open for breakfast, lunch, and dinner, and guests staying in upgraded rooms will receive access to a lounge with a complimentary breakfast and all-day snacks. Other hotel amenities include a flower stand, a gym with a large cardio section, and a beautiful ballroom perfect for hosting special events. 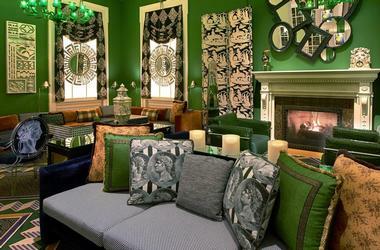 20.The Ritz-Carlton Georgetown, Washington, D.C.
© The Ritz-Carlton Georgetown, Washington, D.C. 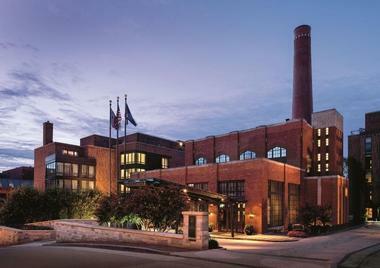 The Ritz-Carlton Georgetown, Washington, D.C. is located inside a historic industrial building in Georgetown, and it offers an excellent selection of rooms and suites with views of the Potomac River. The building has been carefully restored and refurbished, and all of the rooms boast modern amenities like flat-screen TVs, marble bathrooms, iPod docks, and high thread count linens. The hotel gym is conveniently open 24/7, and daily yoga classes are held in the beautiful hotel garden. 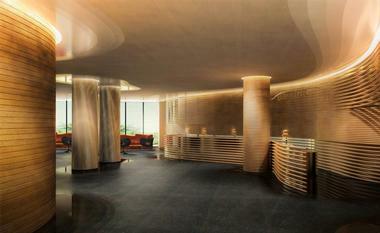 Guests are also welcome to enjoy a treatment at the luxurious hotel spa or a meal at the on-site restaurant. 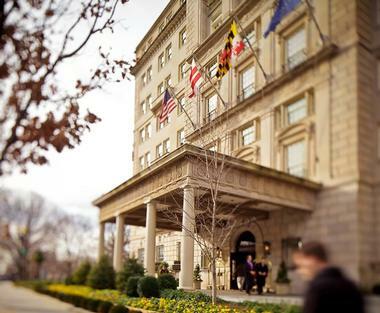 Located right next to the historic Georgetown neighborhood, the Fairmont Washington D.C., Georgetown provides elegant accommodation in Washington's West End. All of the rooms and suites have Italian marble bathrooms, flat-screen TVs with cable and pay-per-view, and excellent views of either the city or the hotel's beautiful garden courtyard; suites also come with separate sitting areas or dining rooms. There are plenty of communal amenities for guests to enjoy as well, including a fitness center with a saltwater pool, a business center, and a restaurant with floor-to-ceiling windows that look out onto the lush courtyard. Tucked away down a peaceful tree-lined street, the Ritz-Carlton, Washington, DC provides a luxurious escape from the busy atmosphere of the city. The comfortable rooms come with flat-screen TVs, Wi-Fi, and iPod docks, and the luxurious marble bathrooms are equipped with soaker tubs and complimentary high-end toiletries. The gym offers state-of-the-art equipment and basketball and squash courts, and fitness classes are held on a regular basis. Live music is played in the lounge every Friday and Saturday night, and the hotel restaurant serves up delectable American fare and a special Sunday brunch every weekend. 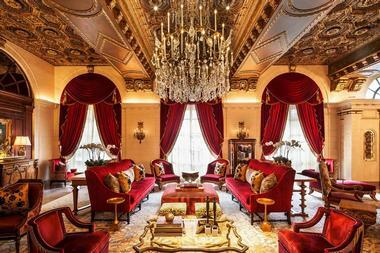 23.The St. Regis Washington, D.C. 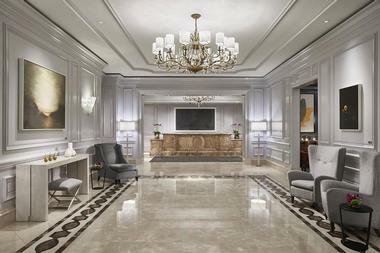 The St. Regis Washington, D.C. has a history of providing accommodation for the nation's presidents, and it's not hard to understand why. 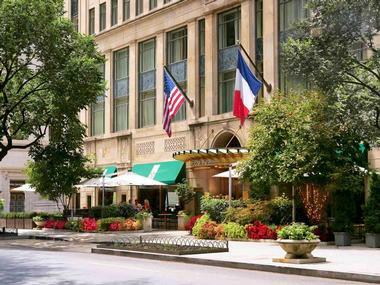 This luxurious hotel is located inside a gorgeous Beaux-Arts building, and the rooms boast state-of-the-art technology and high-end linens and complimentary toiletries. Turn-down service is provided every evening, and a signature butler service is available to guests 24/7. Complimentary champagne is offered in the lobby on a daily basis, and guests can also choose to join in on the hotel's daily afternoon tea ritual, which includes delicious food and a unique theater experience. Only a block away from the White House, W Washington D.C. is housed inside a Beaux-Arts building that dates back to 1917. The rooms feature amenities like large flat-screen TVs, rainfall showers, and designer toiletries, and many offer great views of some of the city's best-known landmarks and attractions. The hotel offers several excellent dining options as well; guests can enjoy a meal at the elegant Mediterranean restaurant, retreat to the whiskey cellar for a drink, or marvel at the view of the White House from the rooftop bar. Other amenities include a posh spa and a 24-hour gym. Just over a mile away from the White House, AKA White House offers one and two-bedroom suites designed for longer-term visitors with upscale tastes. The units boast full kitchens, king-size beds, marble bathrooms, and large terraces; guests are also welcome to relax in the lobby cocktail bar, on the rooftop terrace, or in the spacious lounge. The front desk is open 24/7, and a dedicated team of staff are available to provide recommendations, make restaurant reservations, and cater to guest needs in whatever other ways they can. Wi-Fi is available all throughout the property, and the fitness center is always open. Park Hyatt Washington D.C., Photo: Park Hyatt Washington D.C. The Ritz-Carlton Georgetown, Washington, D.C., Photo: The Ritz-Carlton Georgetown, Washington, D.C. The St. Regis Washington, D.C., Photo: The St. Regis Washington, D.C.
W Washington D.C., Photo: W Washington D.C.
Offering an experience that perfectly blends traditional and contemporary aspects, the Ritz-Carlton, Pentagon City is conveniently situated only a mile and a half away from the airport. The rooms feature luxurious touches like marble bathrooms and Egyptian cotton linens, and some also offer separate living areas. The amenities of Washington, D.C., are only a 10-minute drive away, but the hotel offers two of its own restaurants, one of which serves a special brunch every Sunday. Other amenities include a 24-hour business center and a gym with an indoor pool, a sauna, and a steam room.